Mikhail Sergeyevich Gorbachyov ( Михаи́л Серге́евич Горбачёв , Mihail Sergeevič Gorbačëv, IPA: [mʲɪxʌˈil sʲɪrˈgʲejɪvʲɪʨ gərbʌˈʨof], commonly written as Mikhail Gorbachev; born March 2, 1931) was the last leader of the Soviet Union, serving from 1985 until its collapse in 1991. His attempts at reform helped to end the Cold War, and also ended the political supremacy of the Communist Party of the Soviet Union (CPSU) and dissolved the Soviet Union. He was awarded the Nobel Peace Prize in 1990. Mikhail Gorbachev was born on 2 March 1931 in the village of Privolnoye near Stavropol, the son of a Russian agricultural mechanic Sergey Gorbachyov and Maria Pantelyeva. He faced a tough childhood under the totalitarian leadership of Joseph Stalin; his grandparents were deported for being wealthy farmers known as kulaks. He lived through World War II, during which, starting in August 1942, German troops occupied Stavropol. Although they would leave by February 1943, the occupation increased the hardship of the community and left a deep impression on the young Gorbachev. From 1946 through 1950, he worked during the summers as an assistant combine harvester operator at the collective farms in his area. He would take an increasing part in promoting peasant labour, which he describes as "very hard" because of enforced state quotas and taxes on private plots. Furthermore, as peasants were not issued passports, their only opportunity to leave their peasant existence was through enlisting in 'orgnabor' (organised recruitment) labour projects, which prompts Gorbachev to ask "what difference was there between this life and serfdom?". Despite the hardship of his background, Gorbachev excelled in the fields and in the classroom. He was considered the most intelligent in his class, with a particular interest in history and math. After he left school he helped his father harvest a record crop on his collective farm. So, he was awarded the Order of the Red Banner of Labour, aged just 16 (1947). It was rare for someone his age to be given such an honour. It was almost certainly this award, coupled with his intelligence that helped secure his place at Moscow University, where he studied law from September 1950. Gorbachev may never have intended to practice law however, but simply have seen it as preparation for working in the Communist Party of the Soviet Union (CPSU). He became a candidate member of the Party that same year. While living in Moscow, he met his future wife, Raisa Maksimovna Titarenko. They married on the 25th September 1953 and moved to Gorbachev's home region of Stavropol in southern Russia when he graduated in June 1955, where he immersed himself in party work. Upon graduating, he briefly worked in the Prokuratura (Soviet State Procuracy) before transferring to the Komsomol, or Communist Union of Youth. He served as First Secretary of the Stavropol City Komsomol Committee from September, 1956, later moving up to the Stavropol Krai (regional) Komsomol Committee, where he worked as Second Secretary from April 1958 and as First Secretary from March 1961. Raisa would give birth to their first child, a daughter, Irina, on 6th January 1957. He attended the important XXIInd CPSU Party Congress in October 1961, where Khrushchev announced a plan to move to a communist society within 20 years and surpass the US in per capita production. Gorbachev was promoted to Head of the Department of Party Organs in the Stavropol Agricultural Kraikom in 1963. By 1966, at age 35, he obtained a correspondence degree as an agronomist-economist from the Agricultural Institute. His career moved forward rapidly - in 1970, he was appointed First Party Secretary of the Stavropol Kraikom, becoming one of the youngest provincial party chief in the Soviet Union. In this position he helped to reorganize the collective farms, improve workers' living conditions, expand the size of their private plots, and give them a greater voice in planning. His work was evidently effective, because he was made a member of the CPSU Central Committee in 1971. In 1972, he headed a Soviet delegation to Belgium, and two years later, in 1974, he was made a Representative to the Supreme Soviet, and Chairman of the Standing Commission on Youth Affairs. He was subsequently appointed to the Central Committee Secretariat for Agriculture in 1978, replacing Fyodor Kulakov, who had backed his rise to power, after Kulakov died of a heart attack. In 1979, Gorbachev was promoted to the Politburo (first as a candidate member before receiving full membership in 1980). There, he received the patronage of Yuri Andropov, head of the KGB and also a native of Stavropol, and was promoted during Andropov's brief time as leader of the Party before Andropov's death in 1984. With responsibility over personnel, working together with Andropov, 20 percent of the top echelon of government ministers and regional governors were replaced, often with younger men. During this time Grigory Romanov, Nikolai Ryzhkov, and Yegor Ligachev were elevated, the latter two working closely with Gorbachev, Ryzhkov on economics, Ligachev on personnel. He was also close to Konstantin Chernenko, Andropov's successor, serving as second secretary. His positions within the new CPSU created more opportunities to travel abroad and this would profoundly affect his political and social views in the future as leader of the country. In 1975, he led a delegation to West Germany, and in 1983 he headed a Soviet delegation to Canada to meet with Prime Minister Pierre Trudeau and members of the Canadian House of Commons and Senate. In 1984, he travelled to the United Kingdom, where he met with Prime Minister Margaret Thatcher. Upon the death of Konstantin Chernenko, Mikhail Gorbachev, at age 54, was elected General Secretary of the Communist Party on 11 March 1985, defeating Grigory Romanov who was considered the other favourite. He became the Party's first leader to have been born after the Russian Revolution of 1917. As de facto ruler of the Soviet Union, he tried to reform the stagnating Communist Party and the state economy by introducing glasnost ("openness"), perestroika ("restructuring"), and uskoreniye ("acceleration", of economic development), which were launched at the 27th Congress of the CPSU in February 1986. In 1985, Gorbachev announced that the Soviet economy was stalled and that reorganization was needed. Initially, his reforms were called " uskoreniye" (acceleration) but later the terms " glasnost" (liberalization, opening up) and " perestroika" (reconstruction) became much more popular. Gorbachev was not operating within a vacuum. Although the Brezhnev era is usually thought of as one of economic stagnation, a number of economic experiments (particularly in the organisation of business enterprises, and partnerships with Western companies) did take place. A number of reformist ideas were discussed by technocratic-minded managers, who often used the facilities of the Young Communist League as discussion forums. The so-called 'Komsomol Generation' would prove to be Gorbachev's most receptive audience, and the nursery of many post-communist businessmen and politicians, particularly in the Baltic States. After becoming General Secretary, Gorbachev proposed a "vague programme of reform", which was adopted at the April Plenum of the Central Committee. He made a speech in May in Leningrad advocating widespread reforms. The reforms began in personnel changes; the most notable change was the replacement of Andrei Gromyko with Eduard Shevardnadze as Minister of Foreign Affairs. Gromyko, disparaged as 'Mr. Nyet' in the West, had served for 28 years as Minister of Foreign Affairs and was considered an 'old thinker'. Robert D. English notes that, despite Shevardnadze's diplomatic inexperience, Gorbachev "shared with him an outlook" and experience in managing an agricultural region of the Soviet Union (Georgia), which meant that both had weak links to the power military-industrial complex. The first major reform programme introduced under Gorbachev was the 1985 alcohol reform, which was designed to fight wide-spread alcoholism in the Soviet Union. Prices of vodka, wine and beer were raised, and their sales were restricted. People who were caught drunk at work or in public were prosecuted. Drinking on long-distance trains and in public places was banned. Many famous wineries were destroyed. Scenes of alcohol consumption were cut out from the movies. The reform did not have any significant effect on alcoholism in the country, but economically it was a serious blow to the state budget (a loss of approximately 100 billion rubles according to Alexander Yakovlev) after alcohol production migrated to the black market economy. Perestroika and its attendant radical reforms were enunciated at the XXVIIth Party Congress between February and March 1986. Nonetheless, many found the pace of reform too slow. Many historians, including Robert D. English, have explained this by the rapid estrangement of the 'New Thinkers' and conservatives in the Soviet elite; conservatives deliberately blocked the process of change. This was exposed in the aftermath of the Chernobyl disaster. As English states, Gorbachev and his allies were "misinformed by the military-industrial complex" and "betrayed" by conservatives, who blocked information concerning the incident and thus delayed an official response. Jack F. Matlock Jr. stresses that Gorbachev told the authorities to give "full information" but the "Soviet bureaucracy blocked the flow". This brought international ire for the Soviets and many blamed Gorbachev. Despite this, English suggests that there was a "positive fallout" to Chernobyl, as Gorbachev and his fellow reformers received an increased impetus for domestic and international reform. Domestic changes continued apace. In a bombshell speech during Armenian SSR's Central Committee Plenum of the Communist Party the young First Secretary of Armenia's Hrazdan Regional Communist Party, Hayk Kotanjian, criticised rampant corruption in the Armenian communist party highest echelons implicating Armenian SSR Communist Party First Secretary Karen Demirchian and called for the latter's resignation. Symbolically, exiled intellectual Andrei Sakharov was invited to return to Moscow by Gorbachev in December 1986 after six years exiled in Gorky. During the same month, however, signs of the nationalities problem that would haunt the later years of the Soviet Union surfaced as riots occurred in Kazakhstan after Dinmukhamed Kunayev was replaced as First Secretary of the Communist Party of Kazakhstan. The Central Committee Plenum in January 1987 would see the crystallisation of Gorbachev's political reforms, including proposals for multi-candidate elections and the appointment of non-Party members to government positions. He also first raised the idea of expanding co-operatives at the plenum. Later that year, May would be a month of crisis. In an incredible incident, a young West German, Mathias Rust, managed to fly a plane into Moscow and land near Red Square without being stopped. This massively embarrassed the military and Gorbachev made sweeping personnel changes, beginning at the top, where he appointed Dmitry Yazov as Minister of Defence. Economic reforms took up much of the rest of 1987, as a new law giving enterprises more independence was passed in June and Gorbachev released a book, Perestroika: New Thinking for Our Country and the World, in November, elucidating his main ideas for reform. Nevertheless, at the same time, the personal and professional acrimony between Gorbachev and Boris Yeltsin increased; after Yeltsin criticised Gorbachev and others at the October Plenum, he was replaced as First Secretary of the Moscow Gorkom Party. This move only temporarily removed Yeltsin's influence. 1988 would see Gorbachev's introduction of glasnost, which gave new freedoms to the people, such as a greater freedom of speech. This was a radical change, as control of speech and suppression of government criticism had previously been a central part of the Soviet system. The press became far less controlled, and thousands of political prisoners and many dissidents were released. Gorbachev's goal in undertaking glasnost was to pressure conservatives within the CPSU who opposed his policies of economic restructuring, and he also hoped that through different ranges of openness, debate and participation, the Soviet people would support his reform initiatives. At the same time, he opened himself and his reforms up for more public criticism, evident in Nina Andreyeva's critical letter in a March edition of Sovetskaya Rossiya. The Law on Cooperatives enacted in May 1988 was perhaps the most radical of the economic reforms during the early part of the Gorbachev era. For the first time since Vladimir Lenin's New Economic Policy, the law permitted private ownership of businesses in the services, manufacturing, and foreign-trade sectors. The law initially imposed high taxes and employment restrictions, but these were later revised to avoid discouraging private-sector activity. Under this provision, cooperative restaurants, shops, and manufacturers became part of the Soviet scene. It should be noted that some of the SSRs ignored these restrictions. In Estonia, for example, co-operatives were permitted to cater to the needs of foreign visitors and forge partnerships with foreign companies. The large 'All-Union' industrial organisations started to be restructured. Aeroflot, for example, was split into a number of independent enterprises, some of which became the nucleus for future independent airlines. These newly autonomous business organisations were encouraged to seek foreign investment. In June 1988, at the CPSU's XIXth Party Conference, Gorbachev launched radical reforms meant to reduce party control of the government apparatus. He proposed a new executive in the form of a presidential system, as well as a new legislative element, to be called the Congress of People's Deputies. Elections to the Congress of People's Deputies were held throughout the Soviet Union in March and April 1989. On March 15, 1990, Gorbachev was elected as the first executive President of the Soviet Union with 59% of the Deputies' votes being an unopposed candidate. The Congress met for the first time on the 25th May. Their first task was to elect representatives from Congress to sit on the Supreme Soviet. Nonetheless, the Congress posed problems for Gorbachev - its sessions were televised, airing more criticism and encouraging people to expect evermore rapid reform. In the elections, many Party candidates were defeated. Furthermore, Yeltsin was elected in Moscow and returned to political prominence to become an increasingly vocal critic of Gorbachev. The rest of 1989 was taken up by the increasingly problematic nationalities question and the dramatic collapse of the Eastern Bloc. Despite international detente reaching unprecedented levels, with the Soviet withdrawal from Afghanistan completed in January and US-Soviet talks continuing between Gorbachev and George H. W. Bush, domestic reforms were suffering from increasing divergence between reformists, who criticised the pace of change, and conservatives, who criticised the extent of change. Gorbachev states that he tried to find the centre ground between both groups, but this would draw more criticism towards him. The story from this point on moves away from reforms and becomes one of the nationalities question and the eventual collapse of the Soviet Union. While Gorbachev's political initiatives were positive for freedom and democracy in the Soviet Union and its Eastern bloc allies, the economic policy of his government gradually brought the country close to disaster. By the end of the 1980s, severe shortages of basic food supplies (meat, sugar) led to the reintroduction of the war-time system of distribution using food cards that limited each citizen to a certain amount of product per month. Compared to 1985, the state deficit grew from 0 to 109 billion rubles; gold funds decreased from 2,000 to 200 tons; and external debt grew from 0 to 120 billion dollars. Furthermore, the democratization of the Soviet Union and Eastern Europe had irreparably undermined the power of the CPSU and Gorbachev himself. Gorbachev's relaxation of censorship and attempts to create more political openness had the unintended effect of re-awakening long-suppressed nationalist and anti-Russian feelings in the Soviet republics. Calls for greater independence from Moscow's rule grew louder, especially in the Baltic republics of Estonia, Lithuania, and Latvia, which had been annexed into the Soviet Union by Stalin in 1940. Nationalist feeling also took hold in the Soviet republics of Georgia, Ukraine, Armenia and Azerbaijan. Gorbachev had unleashed a force that would ultimately destroy the Soviet Union. In December 1986, the first signs of the nationalities problem that would haunt the later years of the Soviet Union's existence surfaced as riots occurred in Alma Ata and other areas of Kazakhstan after Dinmukhamed Kunayev was replaced as First Secretary of the Communist Party of Kazakhstan. Nationalism would then surface in Russia in May 1987, as 600 members of Pamyat, a nascent Russian nationalist group, demonstrated in Moscow and were becoming increasingly linked to Boris Yeltsin, who received their representatives at a meeting. Glasnost hastened the development of the nationalities problem. Violence erupted in Nagorno-Karabakh - an Armenian-populated enclave within Azerbaijani SSR - between February and April, when Armenians living in the area began a new wave of protests for the arbitrary transfer of the historically Armenian region from Armenia to Azerbaijan in 1920 upon Joseph Stalin's decision. Armenians were also protesting against the underdevelopment and deteriorating living conditions in the Armenian-populated areas of Azerbaijan. In retaliation, Armenians were massacred in Sumgait, Azerbaijan. A temporary solution imposed by Gorbachev from Moscow did not last, as fresh trouble arose in Nagorno-Karabakh between June and July. Turmoil would once again return in December, this time in Armenia itself, when the Leninakan Earthquake hit the region on December 7th. Poor local infrastructure magnified the hazard and some 25,000 people died. Gorbachev was forced to break off his trip to the United States and cancel his planned travels to Cuba and Britain. Elections to the Congress of People's Deputies, which took place throughout the Soviet Union in March and April 1989, returned many pro-independence republicans, as many CPSU candidates were rejected. The televised Congress debates allowed the dissemination of pro-independence propositions. Indeed, 1989 would see numerous nationalistic expressions protests. Initiated by the Baltic States in January, laws were passed in most non-Russian republics giving symbolic precedence for the republican language over Russian. April would see violent crackdown of nationalist demonstration by the Soviet troops in Tbilisi, Georgia. There would be further bloody protests in Uzbekistan in June, where Uzbeks and Meskhetian Turks clashed in Fergana. Apart from this violence, three major events that altered the face of the nationalities issue occurred in 1989. Firstly, Estonia and Lithuania officially declared their sovereignty in May, followed by Latvia in July (the Communist Party of Lithuania would also declare its independence from the CPSU in December). This brought the Union and the republics into clear confrontation and would form a precedent for other republics. Following this, in July, on the eve of the anniversary of the signing of the Nazi-Soviet Pact, it was formally revealed that the treaty did indeed include a plan for the annexation of the Baltic States to the Soviet Union (as happened in World War Two) and the division of Poland between Germany and the Soviet Union. The Soviet Union's unsavoury past was exposed and gave impetus to the nationalists within the Baltic States who could now even more legitimately claim that they were subject to oppression from Moscow. Finally, the Eastern Bloc collapsed spectacularly in 1989, raising hopes that Gorbachev would extend his non-interventionist doctrine to the internal workings of the Soviet Union. 1990 began with nationalist turmoil in January. Azerbaijanis rioted and troops needed to be sent in to restore order; many Moldavians protested in favour of unification with the newly-democratic Romania; and Lithuanian demonstrations continued. The same month, in a hugely significant move, Armenia asserted its right to veto laws coming from the All-Union level, thus intensifying the 'war of laws' between republics and Moscow. Soon after, the CPSU, which had already lost much of its control, began to lose even more power as Gorbachev deepened political reform. The February Central Committee Plenum advocated multi-party elections; local elections held between February and March returned a large amount of pro-independence candidates. The Congress of People's Deputies then amended the Soviet Constitution in March, removing Article 6, which guaranteed the monopoly of the CPSU. The process of political reform was therefore coming from above and below, and was gaining a momentum that would augment republican nationalism. Soon after the constitutional amendment, Lithuania declared independence and elected Vytautas Landbergis as President. On March 15th, Gorbachev himself was elected as the first and only President of the Soviet Union by the Congress of People's Deputies and chose a Presidential Council of 15 politicians. Gorbachev was essentially creating his own political support base independent of CPSU conservatives and radical reformers. The new Executive was designed to be a powerful position to guide the spiralling reform process, and the Supreme Soviet and Congress of People's Deputies had already given Gorbachev increasingly presidential powers in February. This would be again a source of criticism from reformers. Despite the apparent increase in Gorbachev's power, he was unable to stop the process of nationalistic assertion. Further embarrassing facts about Soviet history were revealed in April, when the government admitted that the NKVD had carried out the infamous Katyn Massacre of Polish army officers during World War II; previously, the Soviets had blamed the Nazis. More significantly for Gorbachev's position, Boris Yeltsin was reaching a new level of prominence, as he was elected Chairman of the Presidium of the Supreme Soviet of the Russian SFSR in May, effectively making him the de jure leader of the Russian Soviet Federative Socialist Republic. Problems for Gorbachev would once more come from the Russian parliament in June, when it declared the precedence of Russian laws over All-Union level legislation. Gorbachev's personal position continued changing. At XXVIIIth CPSU Congress in July, Gorbachev was re-elected General Secretary but this position was now completely independent of Soviet government, and the Politburo had no say in the ruling of the country. Gorbachev further reduced Party power in the same month, when he issued a decree abolishing Party control of all areas of the media and broadcasting. At the same time, Gorbachev was working to consolidate his Presidential position, culminating in the Supreme Soviet granting him special powers to rule by decree in September in order to pass a much needed economic plan for transition to the market. However, the Supreme Soviet could not agree on which programme to adopt. Gorbachev pressed on with political reform - his proposal for setting up a new Soviet government, with a Soviet of the Federation consisting of representatives from all 15 republics, was passed through the Supreme Soviet in November. In December, Gorbachev was once more granted increasing executive power by the Supreme Soviet, arguing that such moves were necessary to counter "the dark forces of nationalism". Such moves led to Eduard Shevardnadze's resignation; Gorbachev's former ally warned of an impending dictatorship. This move was a serious blow to Gorbachev personally and to his efforts for reform. Meanwhile, Gorbachev was losing further ground to nationalists. October 1990 saw the founding of DemoRossiya, the Russian nationalist party; a few days later, both Ukraine and Russia declared their laws completely sovereign over Soviet level laws. The 'war of laws' had become an open battle, with the Supreme Soviet refusing to recognise the actions of the two republics. Gorbachev would publish the draft of a new union treaty in November - which envisioned a continued union called the Union of Sovereign Soviet Republics - but, going into 1991, the actions of Gorbachev were steadily being overtaken by the centrifugal secessionist forces. January and February would see a new level of turmoil in the Batlic States. On January 10, 1991 Gorbachev issued an ultimatum-like request addressing the Lithuanian Supreme Council demanding the restoration of the validity of the constitution of the Soviet Union in Lithuania and the revoking of all anti-constitutional laws. In his Memoirs, Gorbachev asserts that, on January 12th, he convened the Council of the Federation and political measures to prevent bloodshed were agreed, including sending representatives of the Council of the Federation on a "fact-finding mission" to Vilnius. However, before the delegation arrived, the local branches of the KGB and armed forces had worked together to seize the TV tower in Vilnius; Gorbachev asked the heads of these power industries if they had approved such action, and there is no evidence that they, or Gorbachev, ever approved this move. Gorbachev cites documents found in the RSFSR Prokuratura after the August Coup, which only mentioned that "some 'authorities'" had sanctioned the actions. A book called Alpha - the KGB's Top Secret Unit also suggests that a "KGB operation co-ordinated with the military" was undertaken by the KGB Alpha Group. Archie Brown, in The Gorbachev Factor, uses the memoirs of many people around Gorbachev and in the upper echelons of the Soviet political landscape, to implicate General Valentin Varennikov, a member of the August coup plotters, and General Viktor Achalov, another August coup conspirator and later a putschist against Yeltsin in 1993. These persons were characterized as individuals "who were prepared to remove Gorbachev from his presidential office unconstitutionally" and "were more than capable of using unauthorised violence against nationalist separatists some months earlier". Brown criticises Gorbachev for "a conscious tilt in the direction of the conservative forces he was trying to keep within an increasingly fragile... coalition" who would later betray him; he also criticises Gorbachev "for his tougher line and heightened rhetoric against the Lithuanians in the days preceding the attack and for his slowness in condemning the killings" but notes that Gorbachev did not approve any action and was seeking political solutions. As a result of continued violence, at least 14 civilians were killed and more than 600 injured from January 11th-13th, 1991 in Vilnius, Lithuania. The strong Western reaction and the actions of Russian democratic forces put the president and government of the Soviet Union into an awkward situation, as news of support for Lithuanians from Western democracies started to appear. Further problems surfaced in Riga, Latvia, on the 20th and 21st January, where OMON (special Ministry of the Interior) troops killed 4 people. Brown suggests that Gorbachev's response this time was better, condemning the rogue action, sending his condolences and suggesting that secession could take place if it went through the procedures outlined in the Soviet constitution. According to Gorbachev's aide, Shakhnazarov (quoted by Brown), Gorbachev was finally beginning to accept the inevitability of losing the Baltic States, although he would try all political means to preserve the Union. Brown believes that this put him in "imminent danger" of being overthrown by hard-liners against the secession. Gorbachev thus continued to draw up a new treaty of union which would have created a truly voluntary federation in an increasingly democratised Soviet Union. The new treaty was strongly supported by the Central Asian republics, who needed the economic power and markets of the Soviet Union to prosper. However, the more radical reformists, such as Russian SFSR President Boris Yeltsin, were increasingly convinced that a rapid transition to a market economy was required and were more than happy to contemplate the disintegration of the Soviet Union if that was required to achieve their aims. Nevertheless, a referendum on the future of the Soviet Union was held in March (with a referendum in Russia on the creation of a presidency), which returned an average of 76.4% in the 9 republics where it was taken, with a turn-out of 80% of the adult population. Estonia, Latvia, Lithuania, Armenia, Georgia and Moldova did not participate. Following this, an April meeting at Novo-Ogarevo between Gorbachev and the heads of the 9 republics issued a statement on speeding up the creation of a new Union treaty. Meanwhile, Boris Yeltsin was elected President of the Russian Federation by 57.3% of the vote (with a turnout of 74%). In contrast to the reformers' lukewarm approach to the new treaty, the hard-line apparatchiks, still strong within the CPSU and military establishment, were completely opposed to anything which might lead to the breakup of the Soviet motherland. On the eve of the treaty's signing, the hardliners struck. Hard-liners in the Soviet leadership, calling themselves the ' State Emergency Committee', launched the August Coup in 1991 in an attempt to remove Gorbachev from power and prevent the signing of the new union treaty. During this time, Gorbachev spent three days (August 19 to 21) under house arrest at a dacha in the Crimea before being freed and restored to power. However, upon his return, Gorbachev found that neither union nor Russian power structures heeded his commands as support had swung over to Yeltsin, whose defiance had led to the coup's collapse. Furthermore, Gorbachev was forced to fire large numbers of his Politburo and, in several cases, arrest them. Those arrested for high treason included the " Gang of Eight" that had led the coup, including Kryuchkov, Yazov and Yanayev. Pugo and Akhromeyev committed suicide. Most of these men had been former allies of Gorbachev's or promoted by him, which drew fresh criticism. Between the last day of the coup and September 22nd, Estonia, Latvia, Ukraine, Belarus, Moldavia, Georgia, Azerbaijan, Kirgizia, Uzbekistan, Tajikstan and Armenia declared their independence. Simultaneously, Boris Yeltsin ordered the CPSU to suspend its activities on the territory of Russia and closed the Central Committee building at Staraya Ploschad. Symbolically, the Russian flag now flew beside the Soviet flag at the Kremlin. In light of these circumstances, Gorbachev resigned as General Secretary of the CPSU on August 24th and advised the Central Committee to dissolve itself. Gorbachev's hopes of a new Union were further hit when the Congress of People's Deputies dissolved itself on September 5th. Though Gorbachev and the representatives of 8 republics (excluding Azerbaijan, Georgia, Moldavia, Ukraine and the Baltic States) signed an agreement on forming a new economic community on 18 October, events were overtaking Gorbachev. The final blow to Gorbachev's vision was effectively dealt by a Ukrainian referendum on December 1st, where the Ukrainian people voted for independence. The Presidents of Russia, Ukraine and Belarus met in Belovezh Forest, near Minsk, Belarus, on December 8th, founding the Commonwealth of Independent States and declaring the end of the Soviet Union in the Belavezha Accords. Gorbachev was presented with a fait accompli and reluctantly agreed with Yeltsin, on December 17th, to dissolve the Soviet Union. Gorbachev resigned on Christmas Day and the Soviet Union ceased to exist on the 1st January 1992. Gorbachev suffered the indignity of Yeltsin taking over his office on December 27th. Gorbachev had aimed to maintain the CPSU as a united party but move it in the direction of social democracy. The inherent contradictions in this approach - praising Lenin, admiring Sweden's social model and seeking to maintain the annexation of the Baltic states by military force - were difficult enough. But when the CPSU was proscribed after the August coup, Gorbachev was left with no effective power base beyond the armed forces. In the end Yeltsin won them around with promises of more money. In contrast to his controversial domestic reforms, Gorbachev was largely hailed in the West for his 'New Thinking' in foreign affairs. During his tenure, he sought to improve relations and trade with the West by reducing Cold War tensions. He established close relationships with several Western leaders, such as West German Chancellor Helmut Kohl, U.S. President Ronald Reagan, and Margaret Thatcher - who famously remarked: "I like Mr Gorbachev - we can do business together". Gorbachev understood the link between achieving international detente and domestic reform and thus began extending 'New Thinking' abroad immediately. On April 8, 1985, he announced the suspension of the deployment of SS-20s in Europe as a move towards resolving intermediate-range nuclear weapons (INF) issues. Later that year, in September, Gorbachev proposed that the Soviets and Americans both cut their nuclear arsenals in half. He went to France on his first trip abroad as Soviet leader in October. 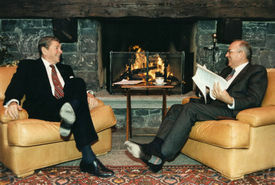 November saw the Geneva Summit between Gorbachev and Ronald Reagan - though no concrete agreement was made, Gorbachev and Reagan struck a personal relationship and decided to hold further meetings. 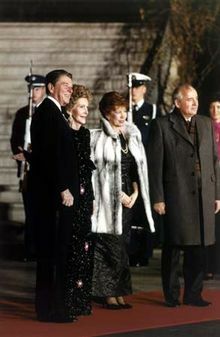 Ronald Reagan, Nancy Reagan, Raisa Gorbachyova and Mikhail Gorbachev December 8, 1987, after the signing of the INF Treaty. January 1986 would see Gorbachev make his boldest international move so far, when he announced his proposal for the elimination of intermediate-range nuclear weapons in Europe and his strategy for eliminating all nuclear weapons by the year 2000 (often referred to as the 'January Proposal'). He also began the process of withdrawing troops from Afghanistan and Mongolia on the 28th July. Nonetheless, many observers, such as Jack F. Matlock Jr. (despite generally praising Gorbachev as well as Reagan), have criticised Gorbachev for taking too long to achieve withdrawal from the Afghanistan War, citing it as an example of lingering elements of 'old thinking' in Gorbachev. On October 11, 1986, Gorbachev and Reagan met in Reykjavík, Iceland to discuss reducing intermediate-range nuclear weapons in Europe. To the immense surprise of both men's advisors, the two agreed in principle to removing INF systems from Europe and to equal global limits of 100 INF missile warheads. Incredibly, they also essentially agreed in principle to eliminate all nuclear weapons in 10 years (by 1996), instead of by the year 2000 as in Gorbachev's original outline. Continuing trust issues, particularly over reciprocity and Reagan's Strategic Defense Initiative (SDI), meant that the summit is often regarded as a failure for not producing a concrete agreement immediately, or for leading to a staged elimination of nuclear weapons. In the long term, nevertheless, this would culminate in the signing of the Intermediate-Range Nuclear Forces (INF) Treaty in 1987, after Gorbachev had proposed this elimination on 22nd July 1987 (and it was subsequently agreed on in Geneva on the 24th November). In February 1988, Gorbachev announced the full withdrawal of Soviet forces from Afghanistan. The withdrawal was completed the following year, although the civil war continued as the Mujahedin pushed to overthrow the pro-Soviet Najibullah regime. An estimated 15,000 Soviets were killed between 1979 and 1989 as a result of the Afghanistan War. It is unlikely that Gorbachev ever intended for the complete dismantling of Communism in the Warsaw Pact countries. Rather, it is far more probable that he intended merely to throw his support behind progressive Communists eager to implement perestroika and glasnost in their own countries. Nevertheless, the loosening of Soviet hegemony over Eastern Europe effectively ended the Cold War, and for this, Gorbachev was awarded the Nobel Peace Prize on October 15, 1990. Gorbachev founded the Gorbachev Foundation ( http://www.gorby.ru/en/default.asp) in 1992. In 1993, he also founded Green Cross International, with which he was one of three major sponsors of the Earth Charter. He also became a member of the Club of Rome. 1995 saw Gorbachev receive an Honorary Doctorate from Durham University for his contribution to "the cause of political tolerance and an end to cold war-style confrontation". In 1996, Gorbachev re-ran for President in Russia, but only received half of 1% of the vote, most likely due to animosity following the Soviet Union's collapse. While on a pre-election tour at that time he was given a punch in the face by an unknown man. On November 26, 2001, Gorbachev also founded the Social Democratic Party of Russia—which is a union between several Russian social democrat parties. He resigned as party leader in May 2004 over a disagreement with the party's chairman over the direction taken in the December 2003 election campaign. In early 2004, Gorbachev moved to trademark his famous port wine birthmark, after a vodka company featured the mark on labels of one of their drinks to capitalize on its fame. The company now no longer uses the trademark. In June 2004, Gorbachev represented Russia at the funeral of Ronald Reagan. In September 2004, following Chechen militant attacks across Russia, President Vladimir Putin launched an initiative to replace the election of regional governors with a system whereby they would be directly appointed by the President and approved by regional legislatures. Gorbachev, together with Boris Yeltsin, criticized Putin's actions as a step away from democracy. In November 2006, Gorbachev was admitted to a hospital in Germany after he reported that he was not feeling well. He had an operation on a blood vessel. In the West, Gorbachev was colloquially known as 'Gorby', in part because of a perception that he was less austere than his predecessors. The ё letter is often replaced by е in writing, hence Gorbachev is a common English transliteration even though it's universally pronounced as Gorbachyov. In 1987, Gorbachev acknowledged that his liberalizing policies of glasnost and perestroika owed a great deal to Alexander Dubček's "socialism with a human face". When asked what the difference was between the Prague Spring and his own reforms, Gorbachev replied, "Nineteen years". In 1989, during an official visit to China during the demonstrations in Tiananmen Square, shortly before the imposition of martial law in Beijing, Gorbachev was asked for his opinion on the Great Wall of China: "It's a very beautiful work", he replied, "but there are already too many walls between people". A journalist asked him, "would you like the Berlin Wall to be taken down?" Gorbachev replied very seriously, "Why not?" Lithuania reestablished its independence on 11 March 1990, on Gorbachev's 5th anniversary as General Secretary of the Communist Party. Gorbachev currently resides in Moscow. On October 25, 2005, in an event organized by the Frank Foundation Child Assistance International ( http://www.frankfoundationcai.org/en/), Gorbachev marked 20 Years of Perestroika. The event was held at the US Chamber of Commerce in Washington D.C. Among others, in attendance were President Clinton, Madeleine Albright, Ted Turner, Colin Powell, Shirley MaClaine, Nobel Laureate Betty Williams, former US Ambassador to Moscow Jack Matlock, and former Secretary of Defense Frank Carlucci. Gorbachev has a cameo appearance in the video game series Street Fighter II and in Street Fighter Alpha 2. He can be seen in the ending of the Russian wrestler Zangief. In his ending in the Street Fighter II series, Zangief is congratulated by Mikhail Gorbachev and dances with him. He is referred to as erai hito (or "great man"). The Bad Religion song "Atomic Garden" Has a line in it that goes "and I'm glad I'm not Gorbachev cause..."
Famous Spanish pop group Locomia released a song called "Gorbachov" where they described him as a superstar for daring to change the Soviet Union. Gorbachev was baptized in the Russian Orthodox church as a child. He campaigned for establishment of freedom of religion laws in the former Soviet Union. Gorbachev has also expressed pantheistic views, saying, in an interview with the magazine Resurgence, "Nature is my god." At the end of a November 1996 interview on CSPAN's Booknotes, Gorbachev described his plans for future books. He made the following reference to God: "I don't know how many years God will be giving me, [or] what his plans are.". Gorbachev is the most famous person in modern times with visible naevus flammeus. The crimson birthmark on the top of his bald head was the source of much satire among critics and cartoonists. (Among his official photos there was at least one on which this birthmark was removed.) Contrary to some accounts, it is not rosacea.